Cross country running does not require a great deal of skill, a fact that makes physical conditioning of vital importance. With little need to work on skill development, more and harder training is often seen as the only path to success. Unfortunately, this path usually leads to injury, immune system problems, psychological burn-out, and a sudden ending to many cross country runners’ brief careers. Kids just do not come back to the program next year. A well educated and thoughtful cross country coach can minimize these issues and setbacks and create a culture on a team that emphasizes career longevity, long-term development, and fun. 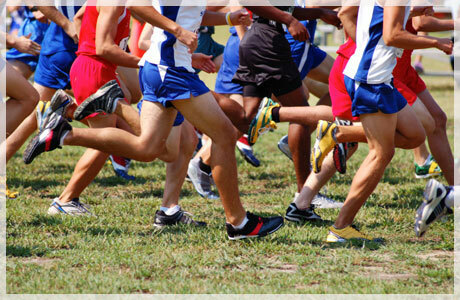 A common paradigm in training cross country runners is to adopt the training regime of the best program in the area, or by taking pieces of a college training program that the coach may have heard about at a coaching clinic. These ideas may or may not be based in science, as information gained in these scenarios is often anecdotal. It is not unusual for some coaches and many athletes to forsake their current training programs and blindly follow the training program of an elite distance runner whose methods are posted on the internet or in the printed word. Such a practice is not recommended and is ripe with problems, but it is also the means by which new, and sometimes effective, training methods are introduced into widespread coaching theory. Examples of this include: Lydiard and his hill running protocol, Gerschler and Reindel on the concept of interval training, Zatopek and his long runs, and the Horwill based British Milers System of five tiered pacing in anerobic work for endurance runners. Even the concept of fartlek, or speed-play, was copied from the journals of outstanding Swedish runners in the 1940s who used it to strengthen the critical zone component of their cross country races and add strength to their normal training regime. On the aerobic side of cross country running development there was the concept of “long slow distance” (LSD), and it became the training rage in the late 1960s and carried well through the 1980s. During this time it was in vogue to pile on massive amounts of mileage during each training microcycle with little regard to the intensity of the runs. This method certainly does develop the infra-structure of the human body, but is not race specific. The ends of the races were undeveloped and indistinguishable from the first part of the races in pace and cadence. Training intensity became secondary to the total work performed. In the process, many long distance records fell and even young runners began logging more and more mileage in pursuit of early success. They were totally reliant on their aerobic development to carry far too much of the load. Records fell because the population of runners had never before logged so much mileage. They were fit and running strong, but eventually the development of just the aerobic system caused a plateau in distance running performance. Prudent cross country coaches these days are listening to scientists more and more in constructing their training schemes. Aerobic energy system concepts have developed even more in recent years due to much research work done by physiologists working on the elite human body with highly refined technological equipment. This information from the scientific community has now reached the everyday cross country coach. Most of the new information centers on training at the “thresholds” for the quickest form of development for an athlete during a training macrocycle. Training at the aerobic threshold retains the developmental qualities of LSD work. Training adaptations lead to a bigger heart, greater blood volume, greater stroke volume, greater mitochondrial development, and a better extraction of oxygen at the working muscle. All of these improvements occur at what coaches consider “conversation pace” for runners on long continuous runs. It is at the aerobic threshold, as physiological development is occurring, that the main metabolic fuel source for the working muscles is stored fat. This spares the more limited glycogen for workouts later in the microcycle or for races. Training at the lactate threshold has become very popular since the mid 1990s to the point at which it is probably overdone because the pace at this threshold is quicker than the aerobic threshold; there is a limit to the duration of the run. Generally, coaches and scientists agree the lactate threshold running is at about 15 kilometer race pace. Training runs of this type are seldom done that far. The classic “tempo” run is at lactate threshold pace for about 4-5 miles. At the lactate threshold, glycogen is the main fuel source. The threshold concept is there, not because of the fuel, but for the waste products generated. It is right at lactate threshold pace that lactate from lactic acid production begins to accumulate in the body and fatigue sets in. Best practice cross country running training will continue to evolve as scientists supply coaches with more information via the scientific method. Long gone are the days of trial and error training schemes by the best coaches. That concept however continues to live on in coaches and runners who refuse to consider new training paradigms and continue to just copy bits and pieces of training theory from others.